As our trusty minivan takes us southward through the North Island in New Zealand, we continually garner new appreciations for this island country. The main north-south road is often just two lanes as multiple lanes in each direction are unnecessary - although they still call it a 'motorway'. Mostly we're on secondary and tertiary roads while many of the best campgrounds are found after a long drive down a dirt road. A couple of days ago, State Highway 1 took us to Taupo, a small town at the north end of Lake Taupo, the country's largest lake. 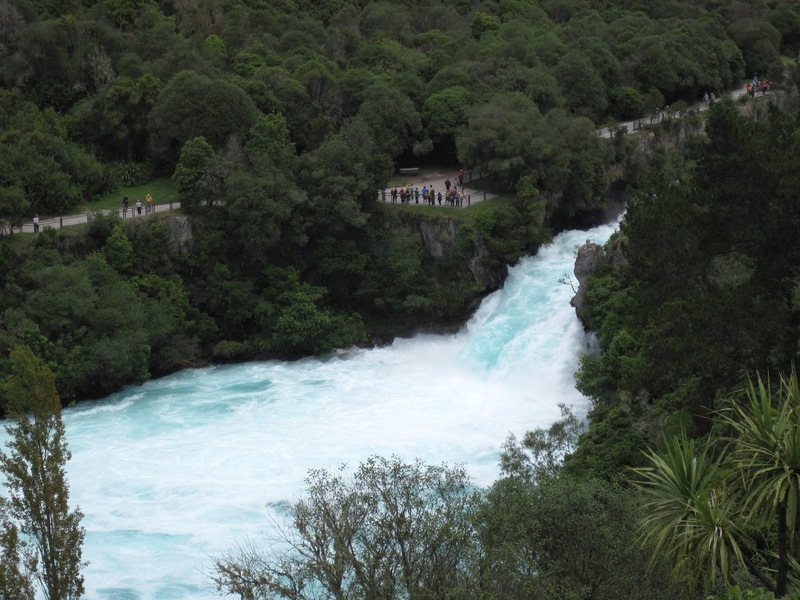 The Waikato River drains off the huge lake and one of the first things it does is creating Huka Falls. Here the river runs deep and narrow, forcing huge quantities of water through a natural rock sluice box. The rumbling it makes shakes the ground. Late that afternoon, we found a Holiday Park (something like a KOA) just outside of town, barbecued hamburgers stuffed with blue cheese and tried to get some sleep in our little tent. Even though our neighbors a few feet away tried to keep quiet, it was a lot noisier than we were used to. The following day we drove south again and this time found a Holiday Park in the Tongariro National Park. 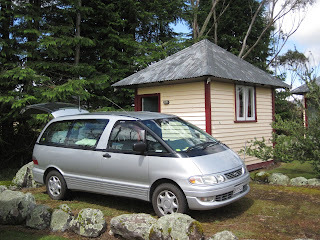 However, the weather was lousy with rain and cold so instead of pitching our tent, we chose to rent a small cabin - I mean very small as there isn't room for much besides the double bed. Toilets, showers and kitchen facilities are about a 100 meters away. The other argument for a room instead of the tent is that we decided to take advantage of the Holiday Park's service of shuttling guests to the start of the Tongariro Alpine Crossing - the bus leaves at 6:15am. Sorry, folks, I'll have to finish this later. The iPad's battery is almost dead and there's only one outlet in the room. Right now the space heater is connected to that one outlet and Ruthie won't let me unplug it!